The 'Player Career Stats Profile' allows associations to set the particular statistics they want to record for players over the course of their careers. Click the Cog on the right hand side of the dashboard and click Settings. 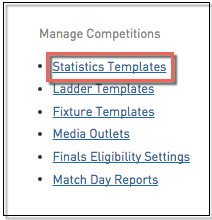 Under Manage Competitions, click on Statistics Templates. Enter in a name for the template and click on the Template Type drop-down list and select Player Career Stats. Click on Update Statistics Configuration. The next screen allows you to select the individual statistics to be used for your Player Career Stats (the stats available to be used are set by the national governing body of your sport). Click on the statistic that you want to use under 'Available Fields' on the left and drag and drop it into 'Selected Fields' on the right. To change the order for the statistics columns in the table, click on the statistic under 'Selected Fields' and drag and drop it into the desired position. To set the fields by which the statistics will be sorted by (eg. sort by number of games, highest to lowest), click on the Sort by 1 drop-down box and and select the field you want to sort by. 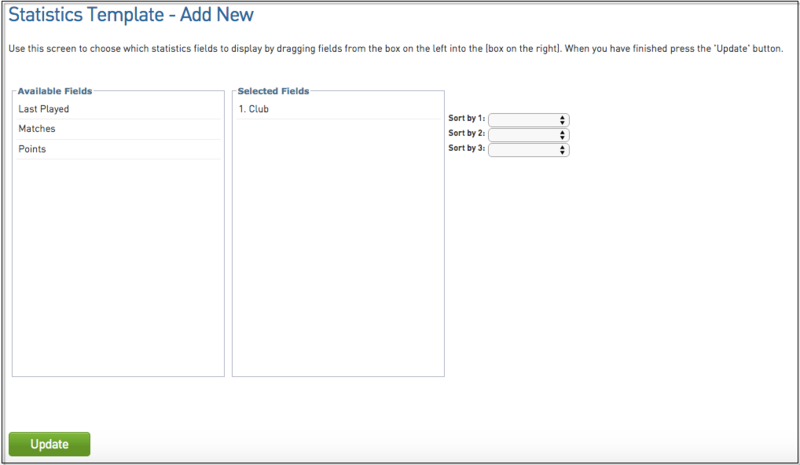 A secondary (Sort by 2) and third (Sort by 3) sort field can also be set. At the association level of Membership, click on Dashboard in the menu. Click on the Edit link next to Details. Scroll down to 'Player Career Stats Template' and from the drop-down list select the required template. Click on Members in the menu, and from the drop-down list select Player Career Statistics.